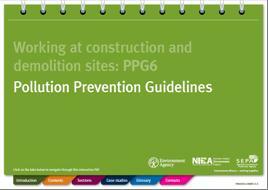 The UK environment agencies have published a new version of the Pollution Prevention Guideline (PPG) Working at construction and demolition sites: PPG 6. Every year there are several hundred pollution incidents on construction and demolition sites that damage the environment. Most can be easily prevented. This guidance document is available online HERE and provides practical steps to help you prevent pollution and has updated references and contact details.